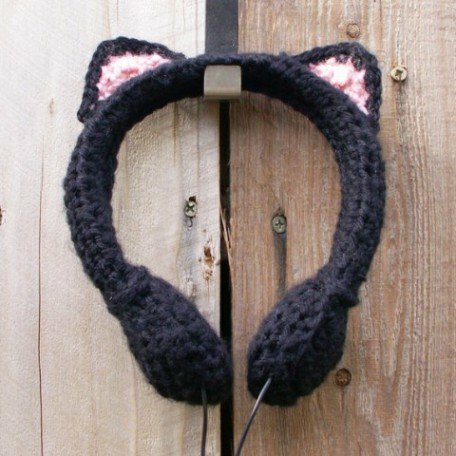 These cute and cozy Black Cat Headphones will show off your sense of style as purrrrfect! Keep your ears warm while enjoying your favorite tunes to rock out a cold day. Display your catittude for all to see whether a little girl or grown woman. They're the cat's meow! Whiskers and tail not included. Not exactly a cat-alog item -- hand-crocheted in California of an acrylic/cotton blend yarn by artist Traci Medeiros in a piece that pairs vintage form with modern function. The headphones are adjustable with a 44" cord. For more information or to order, click here.